Today started with monkeys on our roof. It was quite delightful although it did scare us to death at first...myself more than Sue. She actually had the courage to open the door to see who our intruder was. It ended up to be several monkeys who were throwing things down on the roof of our house, and even hit a power line and knocked our lights out for a moment. At first I was angry because they scared us, but then I thought about it and told Sue that I think this happened just for me. In retrospect I thought that people or animals come near those they know they love them. I know those monkeys came for me. I am only half kidding. But Sue is almost fallling over laughing while I'm reading this to her as I write it. On a serious note...today was nothing short of amazing. I don't know what else I thought it would be but amazing however God is always exceeding my expectations or imaginations of what might happen. As I stood to speak, the first thing I did was let out a shout of victory!!! They all laughed and cheered with me. I said, "Ladies, you have NO IDEA how long I have waited for this moment and how much my heart has just longed to be back with you..." and just expressed my love to them for a few moments time. Then I got into my message which was about the God of the Breakthrough. I just bore my soul to these ladies, and shared some things I've gone through in the time since we were last together, and what God has taught me through it. I didn't hold anything back. At the end of the message I said that I was sure some were in the situation I was in during previous months where I needed a miracle breakthrough and in a desperate place. My altar call for this meeting was for those people to simply stand and lift their hands to heaven, and the rest of us were going to lay hands on them and prophesy to their situation. I thought I'd have a prayer team of about half the room helping me who were already in victory. Imagine my shock when every single one of them stood and lifted their hands to heaven and loudly started crying out for a miracle. 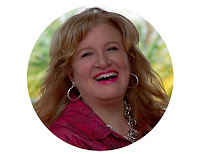 It ended up to be myself, Barb Kuert and Sue who laid hands on all of those women and cried out for their breakthrough and prophesied (spoke to) their miracle. However keep in mind they pray so loud, passionate and hard, you have to really shout to keep up with them. :-) Sue was amazed at their intensity like I knew she would be. Jane Tembu was next to me when I gave the altar call interpreting and as I said stand and lift your hands to heaven she turned to me and said, "Pastor Deanna, I'm sorry, I can't stand anymore...I am so affected by your message because it's everything I've been dealing with in the church. I have to get down on the floor..." and with that she went down on the floor, seeking God. They cried out to God for a long time and then Mama Taifa started singing in Swahili, "There's not a friend like the lowly Jesus...no not one, no not one" and they all started singing it along with her, with everyone weeping and praising God. At the conclusion of that time of worshipping she said, "Ladies, there was no way our speaker knew everything we are all going through, in addition to the violence that has torn up our country in the past year, many of our churches have been affected and also torn up and the majority of us are so weary it is indescribable..." then she went on to say that what we talked about was 100% tailor made by God for the leaders today and everyone was very tearful and just thanking God for what He did for us today. It was so amazing. 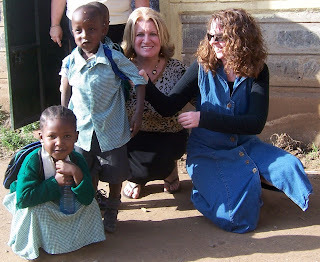 After lunch Pastor Jane Nuthu told me that she had a team of people waiting to take Sue and I into the slums. She said, "I've asked Peter to be one of the people assisting you." 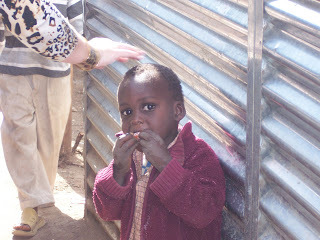 (Peter is one of the Mathare "big boys" that I just bonded with so much last year - Peter, Moses, Christopher, and then one of the Mathare big girls named Gladys.) College age kids are called "big boys" and "big girls", by the way. Anyway, she told Peter I was coming last week and he could hardly wait. I couldn't wait either! For the next few hours we walked through the Mathare slum, (which in a few hours you can't even cover the whole thing - it's huge) and as we walked with the group Peter and I talked and he showed me the slum house (or I should say hut - it's just a few feet big) that he grew up in as a small boy and then he took me to his house that burned and shared with me the news that he has just taken in two orphan boys who lost their parents in the post-election violence. He is sharing his little slum house with them that is only probably 8-10 feet big. He is such an amazing young man that while in desperate situations himself of trying to survive, he has taken in these two children to try and help them, and they are now a part of the Mathare Valley church. Muc h of the time Peter was talking to me I was fighting back tears. I asked him, "what is the ultimate dream for your life, Peter?" As he shared with me his goal of getting in to "next level" type of housing arrangement still in the slums and way below the poverty level, and then graduating to another home in Buru Buru and hopefully having enough to marry and start a family, I was just so humbled and moved to tears. 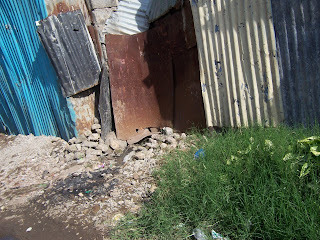 He led us to several slum houses of people he knows and we went into them and spent time with some people -- a single Mom living in a little space with her two kids that was probably about a 4 x 6 foot space. There were no lights inside the little shelter. It was pitch black in broad daylight. Stepping into her little space we had to wait a few moments before our eyes adjusted in the dark and we could even make out where she was sitting in the room. Her children were lying down napping on what I think was a piece of styrofoam next to her. Everything she owned, mostly papers and broken things were lying around her in the little space. Stacy stepped in and then stepped back out almost immediately in tears upon realizing the situation inside. Even missionaries don't get immune to the conditions these people are living in. In sharing with Peter, I have realized that the system really traps them into staying in these situations. Although his little few feet of shelter was burned down in January he still has to PAY FOR IT! He pays two thousand five hundred shillings a month, which is $20. (Huge amount for somebody in the slums) So he pays $20 a month even though the thing was useless. In trying to escape they also charge them astronomical amounts to try to break free. I was amazed to hear all about it and my heart was heavy riding back to the compound just digesting what I had just heard. We stepped inside another lady's little home (again a small space just a few feet by a few feet) and learned she was a single Mom raising three children, in a little cramped space and now her brother died of HIV and she also has his children in this tiny space, just trying to survive. Stepping out of her little hut Peter said he wanted to show me the local toilet those in this vicinity use. He pulled back a dirty blanket hanging there and what was behind it was a pile of rocks that people had peopl e had used the bathroom on. Raw sewage runs everywhere in between the little shelters, and into the streets and the smell is overwhelming. Even though we got much of this on tape, the missionary said, "no matter how much you take back to America on video you can't possibly capture the stench for people to comprehend just how bad this is..."
Another lady asked us to come in and greet her elderly father who was lying in on a little cot in her shelter. 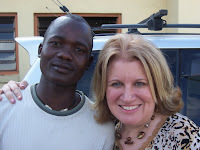 We stepped in and I held his hand and said, "God bless you" in Swahili and Peter interpreted for me as I told him how honored we were to have come to his home. 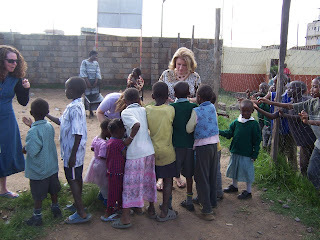 Saying goodbye to the kids who were following us everywhere and not wanting us to leave was really hard. With a lump in my throat, I hugged Peter and said I'd see him tomorrow at the conference, and then got into the land rover with Sue and Chrissy and Stacy to get back to the compound. As we drove home I said to Sue, "no one will ever understand this as much as we try to explain it..." She just solemnly nodded and said, "I know." I try as best I can though, and I hope you've gotten just a glimpse of what it's like to be with God's precious people in what is one of the most desperate places on the face of the earth. Amazing!!!!!! It was difficult to finish reading with all the tears of joy I share in your victories over there. You were sooooo ready for such a time as this!! !